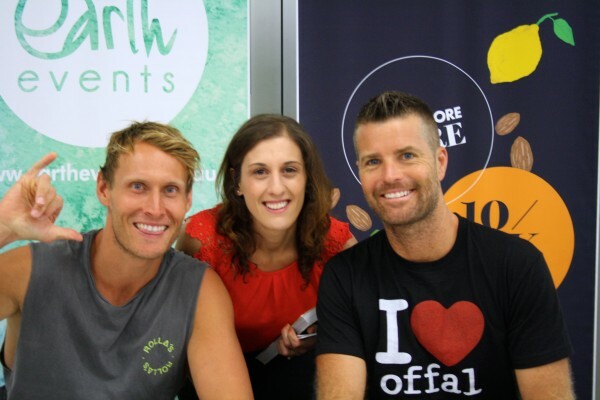 Today I attended “The Paleo Way Tour” event staring Pete Evans, Nora Gedgaudas, Helen Padarin, Charlotte Carr, Luke Hines and The MerryMaker Sisters. The event was very informative and motivational for me, it was great for both new Paleo starters and people who have been doing living the Paleo lifestyle for a while. A room filled with like-minded people, sharing their struggles and their successes. I got so much kind words and support from everyone, it was a wonderful atmosphere and nice way to spend my Saturday while loving hubby took care of the kids. I got so much out of this event, it gave me the confidence to make homemade sauerkraut and it refreshed my mindset of getting into a routine and cooking larger batches so we are not stuck in the kitchen every single day. There was cooking demonstrations by Chef Pete Evans including his love for Bone Broth (who said he does not spit the food out on My Kitchen Rules), Trainer Luke sharing his Musesli and Berry Parfait with Coconut Cream. Charlotte Carr shared great recipes for kids lunches and for hiding nutrient dense offal into children’s diets. With Helen Padarin’s superb knowledge of paediatric health, whilst being a Naturopath, nutritionist and medical herbalist, her topic on Fermented Foods was an eye opener, fermenting e.g: cabbage multiples the vitamin count anywhere from 100 to 300x more. I learnt I can use the juices from the jar to add to children meals and that us adults should add 1 tablespoon a day with our meals too. It was a real pleasure to listen to Nora Gedgaudas expertise on ‘The Paleo Diet’ she is super informative! Paleo recipes are efficient and great at fuelling our bodies for longer. Pastas, breads etc may fill us up for 1 hour but we are looking for more after that hour. So a Paleo lifestyle can be cheap as you don’t need to eat as often and the high nutrient food such as offal, bone marrow and bone broth are extremely cheap. A Paleo fried cauliflower rice is cooked in half the time as a recipe for conventional fried rice would.